Police are investigating reports that two men who robbed a Dundee jewellery shop targeted stores in Aberdeen on the same day. 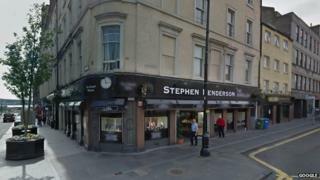 The pair made off with "high-value items" from Stephen Henderson Jewellers in Dundee city centre on 6 February. Two men of a similar description visited shops in Aberdeen with intent to steal earlier the same day. Officers said it was possible the events were linked, and issued a fresh appeal for witnesses and information. The theft in the Dundee store happened at 15:55, with the two men running off down Union Street towards the city railway station. One was described as being white, 5ft 11in (1.80m) tall, with large blue eyes and mousey-coloured facial hair. He was wearing a distinctive navy blue deer stalker hat lined with cream fur, a grey and black striped top, an Adidas hooded gillet, navy jeans and blue trainers. The man spoke with a Liverpudlian accent. The second man was also white, 5ft 8in (1.72m) tall, with short dark hair. He was wearing a black hooded long-sleeved top, light grey Adidas jogging bottoms, light coloured trainers and a dark baseball cap. A spokeswoman for Police Scotland confirmed similar-looking men had targeted two shops on Aberdeen's Union Street at about 13:10 and 13:30 the same day. No crime was committed, but police are investigating possible links with the theft in Dundee.